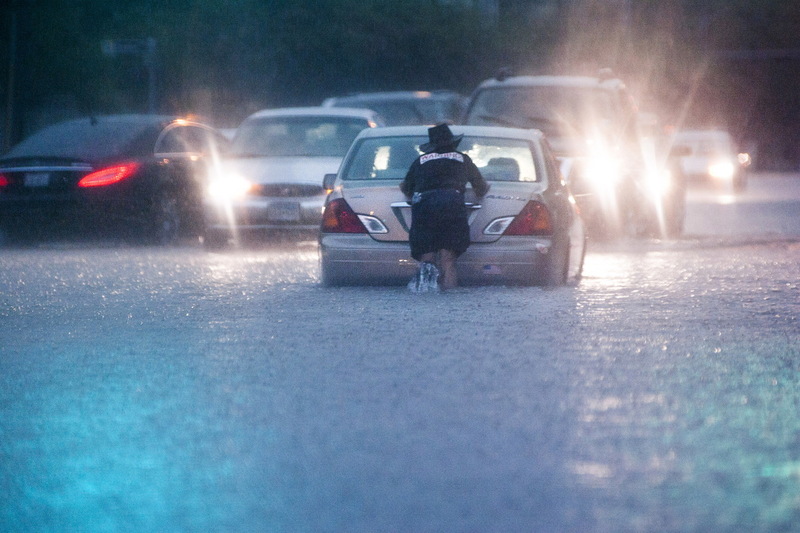 Texas has suffered damaging floods and record rainfall in May after years of punishing drought. We asked John Nielsen-Gammon, professor of atmospheric sciences at Texas A&M University and Texas state climatologist, to discuss how climate scientists – and the general public – can sort out when extreme weather events can and can’t be connected to the effects of climate change. 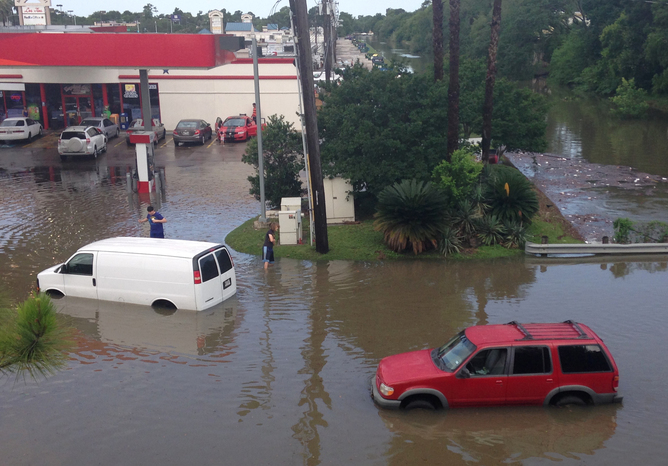 What’s causing the heavy rains behind the dramatic flooding in Texas last week? We have had a moderate El Niño in the tropical Pacific develop this spring, and it is unusually strong for this time of year. Whenever you have an El Niño, it increases the temperature difference from the tropics to the higher latitudes, and that intensifies the jet stream and pulls it a little closer to the tropics. And since Texas is 25 to 37 degrees north, that can make a difference in what kind of weather we get. Usually, that effect tends to tail off toward the end of March because the jet stream moves farther north. But we’ve seen an unusually active subtropical jet stream this month, and it has the hallmarks of being caused by what’s going on in the tropical Pacific. So that’s a necessary aspect of what we’re seeing, because it brings cool air aloft on top of the warm moisture we’re getting from the Atlantic. It also helps produce upward motion, which also destabilizes the atmosphere and triggers convection. Is there a climate change signature with the intense flooding in Texas? There are several ways of looking at it, and it partly depends on what aspect of the event you’re concerned about. For example, the biggest problem in terms of public safety with the rain is localized heavy rain and flooding events. In Texas, they do happen fairly often when all moisture in the atmosphere is converted to rainfall in a small area. Thermodynamically, there’s a limit to how much water vapor can be carried by the air; it depends on the temperature. And the ocean temperatures have increased overall, which means the carrying capacity of moisture in the air has also increased. So the maximum amount of rainfall you can get from one particular rainfall event has also increased. Studies have shown the odds of very intense rainfall in this part of the country have gone up substantially over last century. The cause and effect with climate change and surface temperature is fairly direct. There’s definitely a connection there. What do climate change models say about drought? It depends on how you measure drought. The biggest factor driving drought in Texas and the Great Plains in general is rising temperatures. It’s not clear yet whether the rising temperatures are going to outpace the increase in rainfall that’s been observed to lead to more or less drought overall. We certainly know climate change is going to make temperatures warmer, make evaporation more intense and increase water demand for plants and agriculture, so it will make that aspect of drought worse. But it remains to be seen whether droughts overall will become worse, because that depends on rainfall. Since models are generally projecting a rainfall decrease, model-based analyses show some pretty nasty increases in drought intensity in the area. What does it mean to have more extreme weather events from climate change? I think people take it ordinarily to mean that weather will be more variable. And that’s not necessarily the case. Indeed, most who have looked at changes in temperature have found no increases in variability except maybe in the Arctic, where there used to be more sea ice but there isn’t any more, which does lead to be more variability there. But not for most of the rest of us. But if you think about extremes in terms of comparing to historic norms, as we get warmer we’ll see more record high temperature events and fewer record low temperature events. And it’s asymmetric, because if you imagine the low record temperatures events, you go from very few of them to none of them, and high temperature events go from very few of them to a whole lot of them, depending on how hot it gets. Heavy rain in Houston on Saturday. Extreme weather has caused 23 deaths as of Sunday. So you do end up getting more extremes, even if the range between how hot it gets and how cold it gets doesn’t change, because you’re measuring extremes relative to a different climate in the past. Also, extremes can be extremely unusual, or they can be extremely damaging – they’re really two separate concepts. Extremely damaging events are droughts, floods, hurricanes and tornadoes. And for those, you have to break it out event by event and phenomenon by phenomenon and consider each in turn. In the case of heavy local rainfall, trends have been detected and the models predict an increasing trend, so that’s a pretty solid one. With hurricanes, no trend has been detected, but models predict an increasing trend and we understand why. We’re not as confident in increased intensity of hurricanes, but still the evidence points in that direction. The trouble with detecting a trend is that rare events happen erratically, so it’s hard to tell if you really have a trend or it’s just randomness going on. On the other hand, there could be a trend but the randomness can make it hard to tell for sure. If climate scientists don’t have a long record to work with, how can they predict weather events and their link to climate change? If you don’t have the historic trend to rely upon, you can do experiments with the climate models. They aren’t exact replicas of the Earth, but they are simulations of a planet very much like our own. You can plug in different ocean temperature patterns and different conditions to see what results it has on weather, and get cause-and-effect relationships that way. Running the model for really long periods of time can detect trends that aren’t detectable just with historic records. Given the uncertainties in this process, what are some of the challenges in communicating the role of climate change in weather to the public and policymakers? One challenge is that usually it’s an ill-posed question. People care about individual events, but all you can do is compare actual events to hypothetical events that might have happened otherwise. So it’s not a real comparison; it’s a hypothetical comparison. What we can do is to look at changes in the odds of things happening. But all you can say is events meet a certain definition of being this much more likely or less likely. So it gets away from talking about specific events to a set of events. Another challenge is that the public has gotten the impression, because it’s been repeated, that climate change is going to be causing more extremes. But you really can’t generalize; you have to talk about which types of extremes and where. For example, we do expect climate change to cause more flood and rain events. We also expect more droughts. However, the area of the globe that would experience both of those simultaneously is probably less than half the Earth’s surface. In others words, some places will get enough rainfall to reduce the amount of drought. Some places will get less rainfall, so they’ll have fewer floods. It’s going to be the unlucky few that will get both of them, but people perceive that it’s supposed to happen to everybody. What is the ultimate goal of studying the links between extreme weather and climate change? The aspect of event attribution is a still an immature science. People are working on it because the public seems to care so much about it. But it doesn’t really matter for scientific or planning purposes how specific events have been affected by climate change. What matters is the likelihood of future events being affected, because those are the ones you can plan for. People want to sway public opinion about that urgency of climate change so past and current events get all the attention. As long as scientists don’t overstate the results, it’s OK to talk about this. But it’s more useful for making people aware of climate change than it is for planning or making society more resilient to future impacts. John Nielsen-Gammon is Regents Professor of Climatology at Texas A&M University .